Fitting juniors is extremely important for the development of a proper fundamental swing. Most of the time junior golfers are given cut down clubs that are not correct for them. This leads to them developing compensations in order to hit the ball as straight and far as they can. These compensating moves will very quickly become the blue print for their swing, which in some cases will last a life time. Conversely if a young junior is fitted with the proper length, lie, shaft flex, weight and grip size they will be much more likely to develop solid fundamentals. A set of clubs that is fit for them will also compliment any instruction that they are receiving instead of undermining it. Since Junior golfers grow at such rapid rates a good club fitter can choose a set up of clubs that will allow the set to grow as the junior grows, thus maximizing the length of how long he or she can use them before needing a new set. US Kids Golf Clubs are sized to a proportionate length relative to each 3 inches of a player’s height. Grips- Size and weight are progressively balanced in 9 sizes. Shafts- Shaft stiffness is appropriately applied for each set. 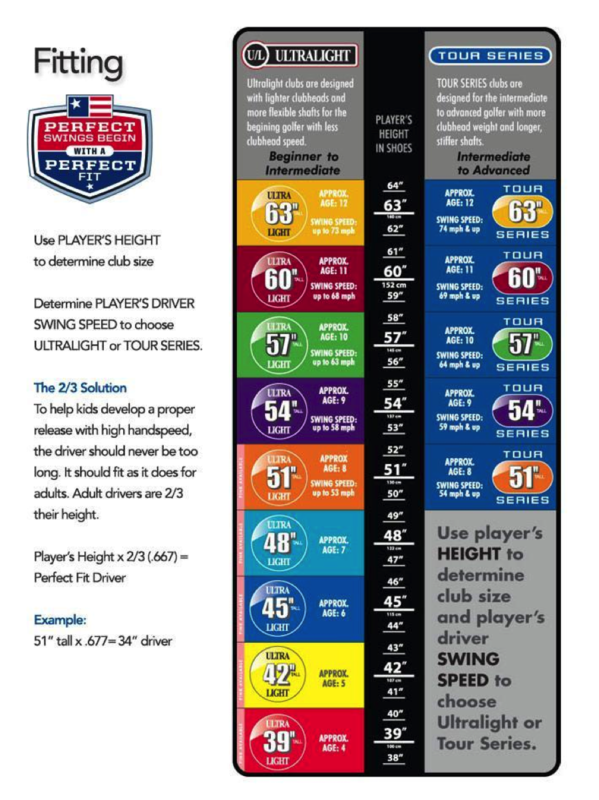 Weight- Our clubs are 5%-30% lighter than adult clubs, depending on the selected set. Skill Specific- Ultralight clubs are for beginner to intermediate players and the Tour Series is for intermediate to advanced players.